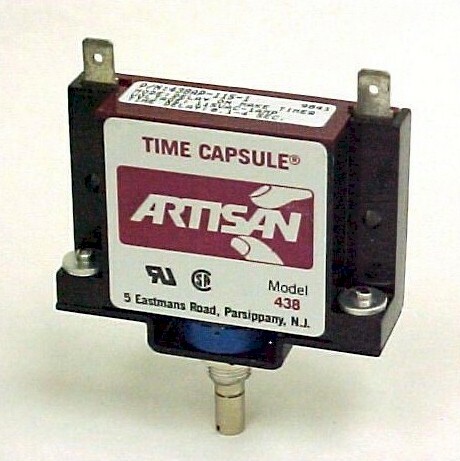 The mode 438AP (Adjustable Panel - Time Capsule) is an all Solid State timer providing Delay on Make control to any load operating from specified operating voltages. The timer is wired in series with the load without concern for polarity. When power is applied, the 438AP remains in the off state. After the preset period has elapsed the timer switches on energizing the load. The timing period is controlled by a potentiometer wired internally, providing a method by which to panel mount the timer. Operating Voltage 12, 24, 48, 115, or 230V AC or DC, input-non-polar. Frequency 50 / 60 Hz for AC Voltages. Timing Range Ten ranges from 100 ms to 900 Seconds. Timing Tolerance Min Time - 15%, +0% Max Time -0%, +15%. Timing Adjustment Potentiometer Adjustable (280 deg. -5%).